Exploring the world of Minecraft, you can meet not only the aggressive monsters, but also the very friendly villagers, who will help you to enchant items or books, sell or buy goods in exchange for a rare emerald, and just to what extent will enliven the gameplay. But you need to find the village. Village NPC (non-player characters) are quite common in the world of Minecraft. 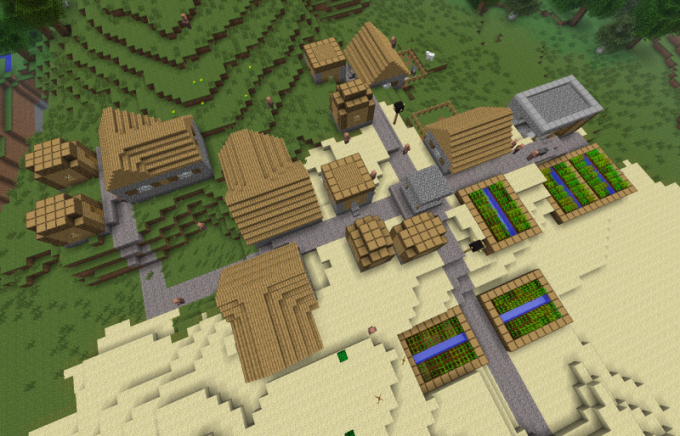 The village is a natural structure, which are found only in desert biomes, plains and Savannah. On the plain the village houses are made of wood, cobblestone and planks, and the desert dwellings are made of Sandstone. Sometimes mistakes happen of generation in the world, and then the village of the plains can be in the desert and Vice versa. There are two ways to find a village - a logical game and software. First: find a high mountain near the plains or the desert, climb to the top, put it in the game settings extra rendering of the world, turn off the fog and look around the area. With high probability you will see the village. However, if you have not very powerful computer, this load may be suspended. So there's another, safer method, though beyond the actual game. Find out the so-called grain of the world (the combination of symbols that the game uses when generating the world). To do this, press F3 or enter the in-game command /seed, opening the chat with the letter t. Note the resulting value, end the current session and create a new superflat world consisting of biome plains. In the setting of the Foundation of the world will be the Seed for the World Generator. Write back the known value of the grain world. Select the creative mode. Set the maximum possible distance in the world, using double pressing the jump take off, so far as the draw distance, and fly to the nearest discovered the village. Write down the coordinates of the village. We will conclude this session and go back to the previous one. With high probability, the village will be in the same place in both worlds. Often the villages in Minecraft are virtually on the diagonal. Consider this, if you have a need to find more than one village. Grab the emeralds or some wheat with them, going in search of the village. You may want to enchant things or to buy something. In the villages there is a possibility to enchant things without having to spend experience.